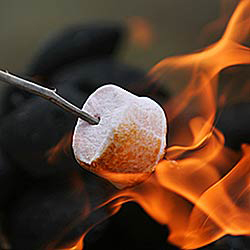 August 30th is National Toasted Marshmallow Day. 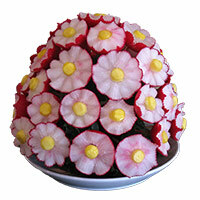 That’s right, now there’s a day where you don’t have to feel guilty about indulging in this yummy, sweet treat. 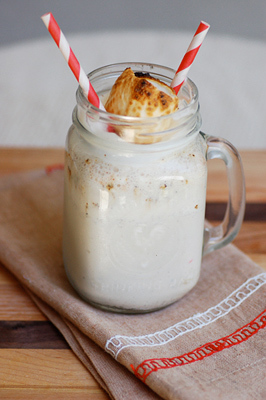 Sticky, gooey and oh-so-good – almost nothing beats a toasted marshmallow at a backyard bonfire. This soft, pillowy confectionery is so well loved that it gets its own national holiday! August seems to be a good time to celebrate food because August 3rd was National Watermelon Day, and August 15th is a day of food and wine celebrations in America for legendary TV chef Julia Child’s 100th Birthday, if she were alive today. The origin and creator of Toasted Marshmallow Day is unknown, although I’ve read that it has been celebrated for many years. Some sources suggest that this food holiday was created on August 30th as a way for families and friends to enjoy the last day of summer holidays before the kids go back to school. After all, toasting marshmallows has become somewhat of a tradition in the summer, especially during camping trips and backyard bonfires. 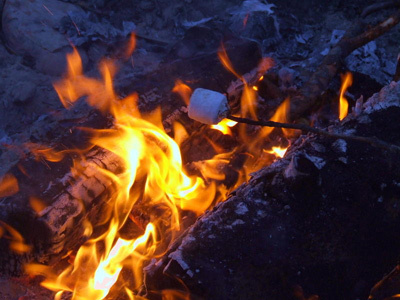 Did you know that the history of marshmallows dates all the way back to ancient Egypt? 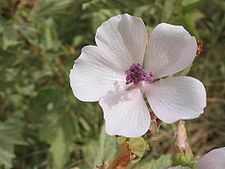 Pharaohs used to eat the sweet extract from the mallow plant. 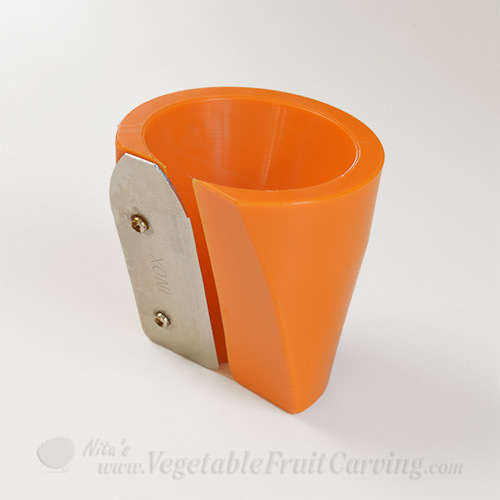 Sometimes this extract or sap would be mixed with nuts and honey. Later in the 19th century, bakers in France discovered that they could whip the sap from the mallow plant and sweeten it to make something similar to the marshmallow we know today. It was actually an American named Alex Doumak who invented a way to make marshmallows in an automated way using tubes, giving it the cylindrical shape we’re familiar with today. I’m not sure who created the idea of a toasting marshmallows, but it was pure genius! So on August 30th, gather some friends around a bonfire, grab some sticks, a bag of marshamallow and satisfy your sweet tooth on Toasted Marshmallow Day! A couple of weeks ago I attended the annual beach barbeque that one of my friends throws every year. She makes the most delicious toasted marshmallow s’mores. She takes one of those racks with a long handle that is meant for grilling and turning burgers or fish over a BBQ grill. She fills the rack with graham crackers placing a square of chocolate on each graham cracker square. She then heats them over the fire so that the crackers are warm and toasted and the chocolate is soft and melted. In the meantime, the guests roasted their own marshmallows to their own liking. I like mine melty on the inside and just a little burnt on the outside. When I added my toasted marshmallow to the cracker with the already melted chocolate it was one of the best s’mores I’ve ever had. Delicious. 1. Preheat the broiler. On a foil-lined baking sheet, place half of the marshmallows in a single layer; broil until charred, 3 minutes. Transfer to a plate to cool. Place the remaining marshmallows on the sheet and roast until just toasted, 2 minutes; let cool. This recipe makes four servings. Doesn’t it sound yummy? 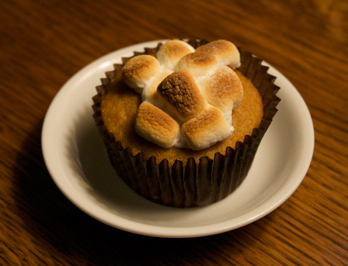 All you have to do for this recipe is make your favorite cupcake, then in the last few minutes of baking, throw one large or a few small toasted marshmallows on top and continue baking. Voila – you have instant marshmallow icing for your cupcake! When I was on the San Diego Living Show, I met Kathy Strahs who writes a blog called PaniniHappy.com. She has a great recipe for Nutella S’mores. 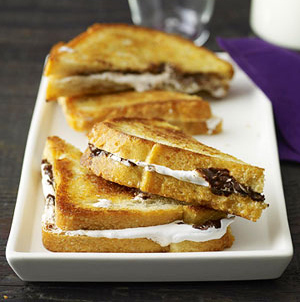 After she was on her segment of the show, the host Marc Bailey was raving off camera about how good her s’mores panini was. He said he that before tasting this panini, didn’t think that s’mores could be improved on but apparently, they can. 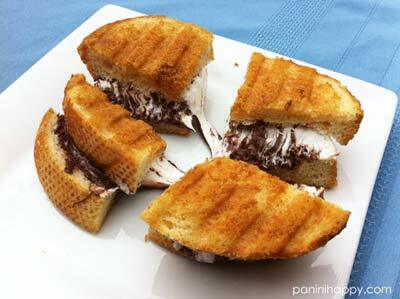 You might want to try her delicious recipe Nutella S’mores Panini. Another option – you can put some toasted marshmallows in the middle of a peanut butter and jam sandwich. 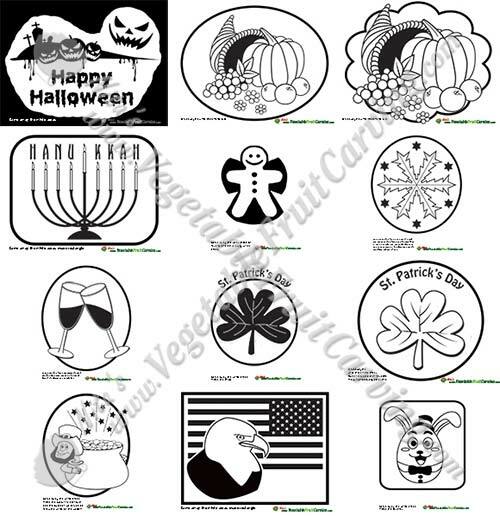 It’s a good thing this food holiday is only one day out of the year! Sure, marshmallows are known as a sweet treat, but there some functional ways to use it that you may not have thought of before. 1. Lozenge for sore throats – the gelatin that binds the marshmallow is actually helpful in soothing irritation in your throat. Make sure to chew the marshmallow instead of sucking on it whole. What a delicious remedy, don’t you think? In fact, I read some sources suggesting the marshmallow was first used as a medicine in Egypt before it was eaten. 2. Home remedy for boils and abscesses – the high sugar content of marshmallows helps to draw out pus and dead matter that make up abcsesses on your skin and gums. This should be done when the boil has reached its head. Remember that this is just a home remedy and should not be used as a substitute for medical care of more serious conditions. I don’t know how well these remedies actually work. If you try these out, let me know. 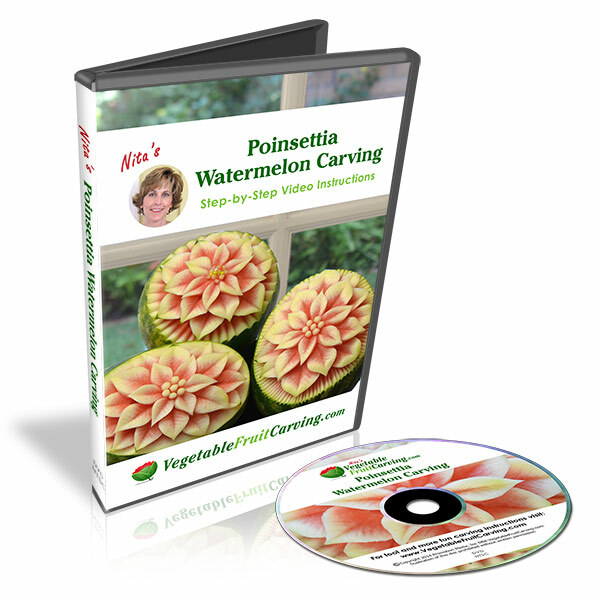 If you like learning about unusual ways to use food, you might enjoy my post about Wild and Wacky Watermelon Ideas, where you can watch a video of people watermelon skiing! I hope you’re been enjoying your summer. It’s not too late to join some friends and family for good old fashion bonfire fun with toasted marshmallow s’mores today.